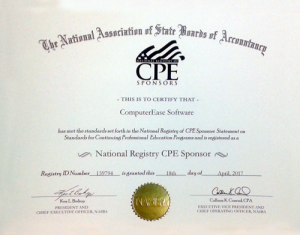 ComputerEase announced today that it has been approved as an official sponsor on the National Association of State Boards of Accountancy’s (NASBA) National Registry of CPE Sponsors. This new sponsorship approval means that ComputerEase will be able to offer Continuing Professional Education (CPE) Credits to attendees at their regular Educational Webinars, particularly those aimed at Construction CPAs. The NASBA has stringent standards on the companies that can be listed on their Registry. The process lasted for several weeks and included an audit of one of the classes to be offered. Meeting these standards means that ComputerEase is prepared to offer construction-focused CPAs the highest quality of continuing education credits, ensuring that their trade knowledge remains relevant. Meibers noted that CPA Partners will have access to the ComputerEase customer portal, where video recordings of each webinar will be archived and available for re-watching. Click here to learn more about the ComputerEase CPA Partner Program. This entry was posted in Company News, Education by ComputerEase, Construction Accounting Software for Contractors. Bookmark the permalink. ComputerEase is the leading provider of accounting, project management and field-to-office software for the construction industry. Thousands of contractors have trusted ComputerEase to run every aspect of their business for the last 35 years. From startup companies to large organizations, ComputerEase gives you the flexibility to have it your own way, which makes it the ideal fit for companies of all sizes and all trades. Visit construction-software.com to learn more about how ComputerEase gives contractors the software tools they need to keep building.